We present association results from a large genome-wide association study of tooth agenesis (TA) as well as selective TA, including 1,944 subjects with congenitally missing teeth, excluding third molars, and 338,554 controls, all of European ancestry. 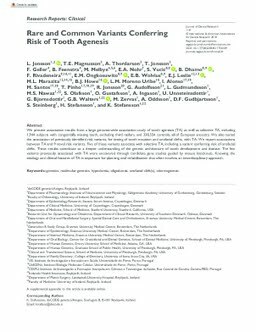 We also tested the association of previously identified risk variants, for timing of tooth eruption and orofacial clefts, with TA. We report associations between TA and 9 novel risk variants. Five of these variants associate with selective TA, including a variant conferring risk of orofacial clefts. These results contribute to a deeper understanding of the genetic architecture of tooth development and disease. The few variants previously associated with TA were uncovered through candidate gene studies guided by mouse knockouts. Knowing the etiology and clinical features of TA is important for planning oral rehabilitation that often involves an interdisciplinary approach.